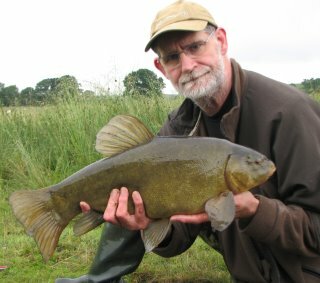 I'd been debating whether to have another tench session for most of the week, mainly because the weather forecast was for rain, more rain, and a little more rain. I put it off until the forecast had worsened then decided to go anyway. As I arrived on the Sunday afternoon conditions were grand, light wind from the south west, sunshine and warm. I pretty much had the choice of swims and headed for the shallows, even though the the track was a bit slippy and the car didn't always go the way it was supposed to. While setting the rods up a few spots of drizzle fell so up went the brolly, but the shower soon passed and two method feeders were out and a boilie rig with a bag of pellets - all at staggered ranges. The dreaded maggot feeder having been abandoned. Things looked good, and a couple of fish rolled. 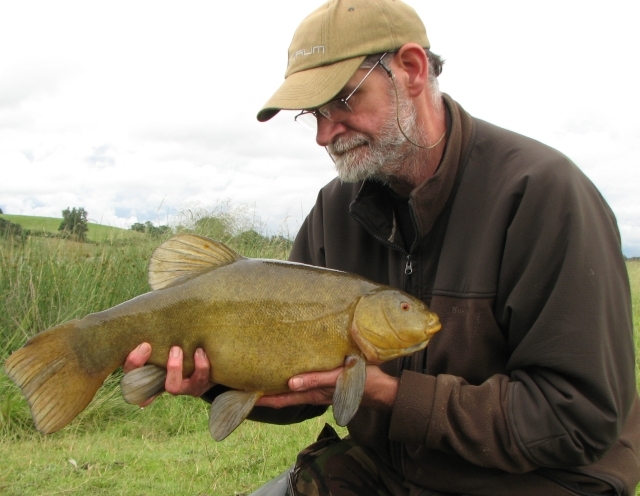 As so often has been the case, conditions that appeared perfect failed to result in any fish. After dark it started to rain, as per the forecast but not as heavy as expected. During the night the wind swung round forcing me to reposition the brolly twice. Apart from hooking a small bream which fell off close in those were the only disturbances during the night. The morning dawned dry, but the wind decided to swing round yet again, and blow straight into the brolly, so I had to turn it round again. Soon after more rain came along. 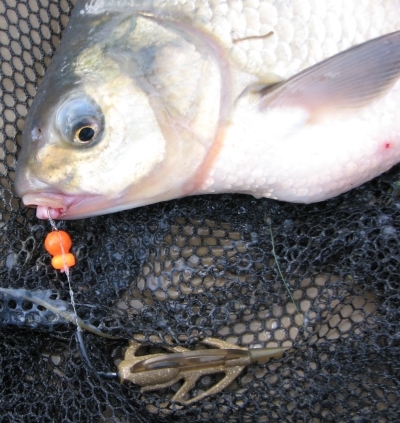 The first fish of the day came around 6.30, a bream of five or six pounds that fell to the method rod fishing a 10mm boilie with a grain of fake corn. A little over an hour later a proper run to the other method rod with the two grains of corn resulted in a tench of just under eight pounds. Result. Both method rods soon had corn on them. The rain faded away and the day turned out warm when the sun broke through the constantly changing cloudscape. Meanwhile on the radio I was hearing tales of serious flooding in other parts of the country. It seemed unbelievable with the weather I was experiencing as I reeled in a succession of bream in the three to five pound range. You can only take so many small bream, so I started to drop the second feeder a bit closer in, which did the trick of avoiding the bream. Late in the afternoon the wind swung round yet again. Would it never make up its mind and settle into coming from one direction? With the brolly moved, I settled down to make something to eat. The wind strengthened, forming white caps on the waves. I have found that this kind of a blow has often brought the tench on the feed, and as I finished off a tin of Irish stew a tench decided it fancied two 10mm boilies for its tea. 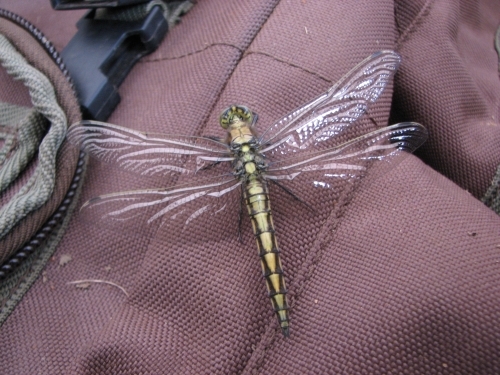 Fighting a big six with the rod, and the wind with the landing net was quite a tricky job. But I managed it. Forty minutes later the boilie rod was away again, this turned out to be fantastic looking big seven - the pictures failing to do it justice. I was expecting another tench at any moment, but a small bream to one of the method rods was the final fish before the heavens opened - and the wind changed up a gear. By now the alarms were bleeping all the time, the rods arced round, and when I wound one rod in the line was festooned with weed. It was starting to get silly. The rigs wouldn't be fishing effectively, and the weed gathering on the line would have posed problems had a fish been hooked. When the brolly tried to change shape it was decision time again. During the day the track had dried out nicely and would have been easy to drive down, but the rain over the last couple of hours had turned it to slime again. Option one: wind the rods in, batten down the hatches, sleep through the storm and fish again in the morning when it had all calmed down. Option two: pack up immediately and make a run for it - keeping fingers and toes crossed that the car wouldn't get bogged down. Deciding that I was supposed to be enjoying myself I hastily, and roughly, packed the gear away as the rain lashed down, slinging the gear in the back of the car anywhere it would fit. Now for the fun bit - don't stop the forward motion once the car is moving! It started off easily enough on firm ground, then came the rutted dip. Down into it was easy, then the wheels began to spin faster than they were moving forward. Slowly the car came up the other side, painfully made progress up the next slope, then it was downhill all the way. So long as I didn't collide with a sheep I'd made it!